Who would expect to find mighty American bisons in the Belgian Ardennes ? Not a lot of people, that's for sure. And yet, if you are travelling between Bastogne and Houffalize, through the little village of Recogne, you will stumble upon a herd of 250 of these enormous beasts. A local farmer and his wife got the wild idea to import the bisons from the United States in 1990. Raising bisons makes perfect economic sense. Their meat is delicious, tender, low in fat and poor in cholesterol. The meat is 100% organic as the animals only feed on grass, which they manages to find even under the snow, unlike cows. 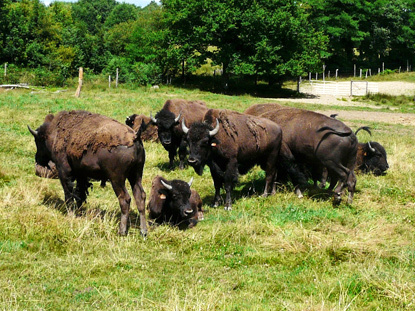 As export of bisons are now prohibited in the USA, the small Walloon farm has become an exporter itself, catering to the rest of Europe. 90% of the bisons found in Europe today descend from the Recogne herd. In a way, these Belgian breeders have acted as pioneers for the European market. Kindled by the acute interest expressed by many visitors, the couple set about to open a museum about Native American culture, indissociable from bisons. This is no tacky amateurish affair. An expert on Amerindian civilization who had lived 40 years among Indian tribes, was brought in to set up the exhibits. Everything is professionally displayed, and authentic Amerindian garments, tipis and everyday life objects. A two-day Indian Festival is held in mid-July, with a live camp, Indian drum music and dances, a parade, the reenactment of an Indian attack on an U.S. fort, and even a concert of Country music and line dance. You will find more information about the festival, the museum's opening hours and local lodging (B&B) on the farm's official website in English. Unfortunately there are no trains to Recogne or even to nearby Bastogne, so you will need your own wheels to get there. Access by car is easy enough though, as Recogne sits along the E25 motorway (Liège-Luxembourg), just 5 km away from Houffalize (exit 52) or Bastogne (exit 54) on road N30.